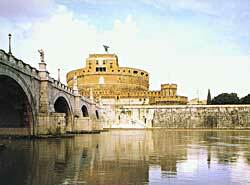 Rome went from being a small town in Italy to being the center of a vast empire. This took hundreds of years and many wars. Rome was a lot like the present day United States - their government (for a while) but, most importantly, our attitude. The Romans were just like us in that they wanted it ALL. Our language, English, (and Spanish and French) comes from their language. In 800 BC a Latin Princess had twins, fathered by the god Mars. Since the princess was never supposed to have children, she was punished by having her sons taken from her. They were left on the banks of the Tiber River to die. A she-wolf found the boys and raised them, until she was killed by a shepherd. Then the shepherd took the boys home and raised them. 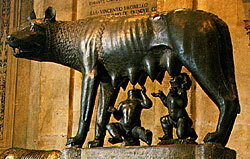 They built a city, then Romulus killed Remus and named it Rome. 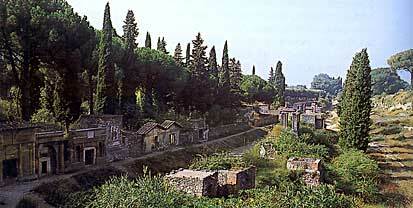 The Etruscans lived north of Rome in Etruria. No one knows where they came from. The Etruscans spoke a different language than anyone else in the ancient world. They were Italy's first highly civilized people. Etruscan people were farmers, miners, merchants, and metal workers who enjoyed music and dancing. Women had rights; they could own property and go out in public. The Etruscans had a mighty army. Their view of the universe prompted them to build cities to face East and Left. The west (right) represented "gods of death" and was considered unlucky. The center (faced south) represented "humans," and the east (left) was the "gods of the heavens," considered lucky. They had to find out what the gods wanted. Soothsayers read the omens from sacrificed animal livers, directions and sounds of thunder, flight of birds. Etruscans had catacombs, underground tombs of the dead, that were decorated. They had a necropolis - cemetery, city of the dead.